Where can I download the MMD MotionSmoother Tool? How do I use the Tool? Is there a shortcut to making smoother motions? MikuMikuDance is an amazing software to animate with, with little to no limits on what you can do. Animating is a long challenging process that takes a lot of time and effort depending on how you want the final production to look. You may not need to spend all that time to edit your motion keyframes with the “interpolation curve” if you want a liquid smooth look to your animations. I have discovered one simple tool you can use to do all that within a few clicks and seconds: the MMD AnimationSmoother Tool. The source of this tool is unknown; some of you may already know about this tool. Download the Motion Smoothing Tool. It’s a free download. Unzip the folder… we recommend using Bandizip. Once you have created your motion file, save it to a location where you can drag it directly into the tool; preferably save it in the same location as the tool. Once you have dragged the file and clicked OK on the tool it will take a few seconds to create the motion file, the new file should be named Out.vmd and should be saved on the Desktop or the same location as the tool or motion data. Note that, because every frame has data in it, you can’t really edit that motion after the motion-smoother is applied. 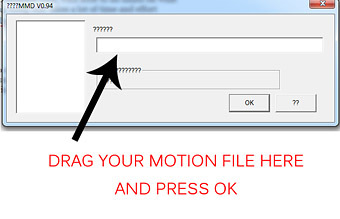 So, if you want to make changes to the motion, keep a backup of your original motion file. Edit whatever you need to in that original file and then when you are certain everything is right, place it into the tool and load it again. … Also note that the new motion file is a much larger file size than the original motion file. Because the newly created motion file is SO huge, you may find that a longer motion will lock-up MMD… so, you might want to use it on only short-parts of your motion file. Create a VMD of just the part of the motion that you WANT to smooth… smooth it… and then copy/paste that motion back into your main production. 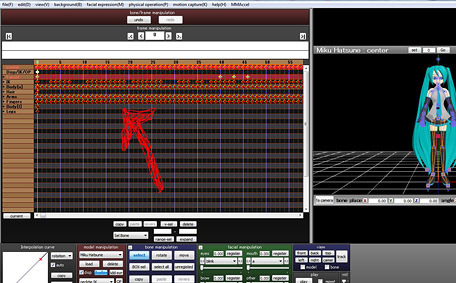 Here is an example of the MotionSmoother… the Haku on the Left is the original motion file. Add any motion file you want to the tool. It will correct and smooth any motion file you please. Download the Motion Smoothing Tool. … and give it a try! its not even a long motion either… a minute and 40 seconds at least. Check it out… That tool adds a registered diamond in every frame… 100-seconds @ 30fps = 3000 frames with a wall of registered diamonds in every frame… “Exceeds” is probably an understatement! … It probably almost locks-up your computer when you try to SAVE that dance! That tool is useful only for short bits of animation. what’s the point of the tool if it can’t be used for even a 1 minute song? Well said. It’s not my tool. I didn’t design it… it is just “out there for your use”; offered by its creator… You are free to use it…or not. I find no use for it, myself, but the author of that tutorial thought it was cool! mine has some error and says its not a vmd help..
More details, please. What said what, and what did you do to it? I’ve had the same problem- whenever I load the Motion Data onto the model, I receive an error saying “This is not a Vocaloid Motion Data file !!”. Do you know how to fix it? Or if there is a previous version of the motion smoother I can use? It’s hard to tell, the tool is really new (the tag on Mediafire page says this September), and none of us heard of it previously. Maybe if you upload the model, the source motion, and the converted motion somewhere we could inspect them for ourselves, someone might take a look. You cannot load camera motion data into the tool. only valid model data. Before you save the VMD. file select all keyframes and save it to a folder. and then drag and drop it into the tool. it should work. You download the RAR folder… drag it to your desktop… ((We recommend you use BANDIZIP to extract your RAR and ZIP folders) double-click on that RAR and choose EXTRACT to unzip the folder and, on your desktop, you will see the new folder… double-click the .exe file to open the little window. Drag your existing .VPD motion file into the window and click OK. … a new .VPD file will be created. Use that new VPD as your motion file. … NOTE: do this for only shorter motions… something over a minute long will generate a HUGE .VPD file that may cause MMD to lock-up! … this is best used to smooth little portions of larger motions.